Had a great weekend at Stampfest and saw a lot of friends!! Thanks for stopping by and saying Hi! This morning on Splitcoast the Try a New Technique is a framed one and here is my take on it. 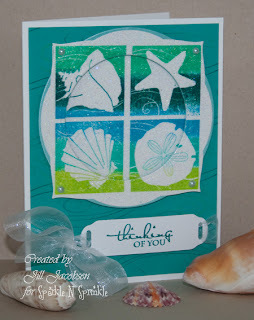 I started with my Summer Swirl stamp set from Sparkle N Sprinkle (and it's actually on sale this week!) and stamped with a Kaleidoscope ink pad, I stamped it twice (once for the background and once for the frame). Since I had been using so much Sparkle embossing powder at Stampfest I decided it would look good on this image so I embossed the entire image with it:) Then I cut out the frame using the Spellbinders Labels 3 and the Circles. For the frame I layered it on a larger circle just to give it more strength. 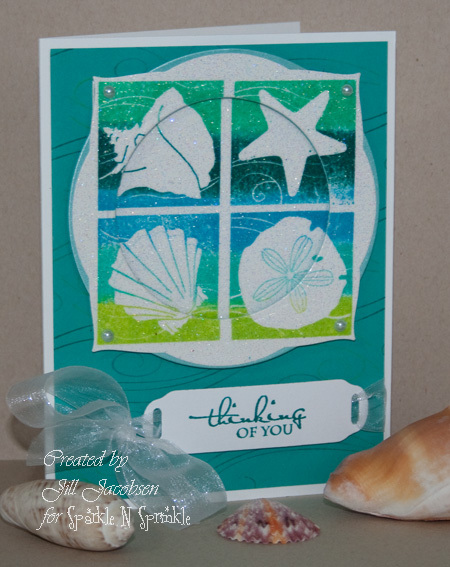 I stamped the sentiment with a new stamp set that will be revealed soon called Thoughtful Frames, and I used the Spellbinders Tags to mount it.